First of all, I'm here! I've been getting complaints that my posts are getting more and more infrequent. I hear ya already!! Gus and I have been going to the pool every day, where I think about how I wish Aunt Laura were around to gossip with. She used to be my deep-end-treading-water-gossip companion. But Gus has been mastering freestyle and diving, and I've been blissfully treading water in the deep end and doing some unenthusiastic laps during his lessons. 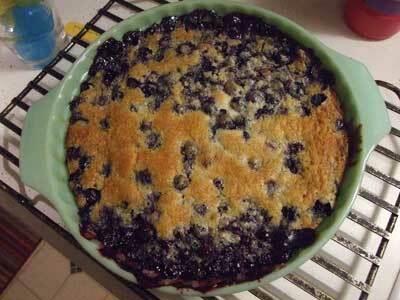 I've made a blueberry buckle and a plum crisp with all the ding-dang CSA fruit. I can't keep up! Nothing has been as good as the cherry pie, but I'm enjoying trying. 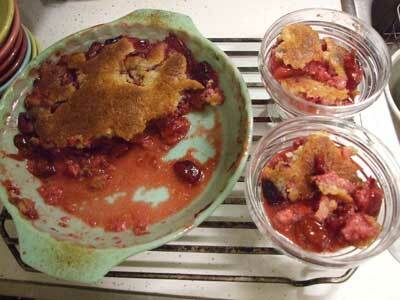 The plums were very sweet, so I didn't add much sugar, but somehow they got extra-SUPER-tart in baking. It was still good. The Phillies we won't talk about so much. I'm hoping Joe Blanton pitches a little bit better. I'm hoping Brett Myers pitches A LOT better. He is a mere shadow of his former self. The #@*$( Mets are in first place now. Maybe this will awaken the mighty Phillies bats again. Cross your fingers. I never thought I would miss the 'roid raging Myers, but wow. I hate this tentative, unsure Brett. Bring back the swagger! my posts have been lacking lately, too. i think it all picks up in the fall. oh yeah. Well, they didn't awaken last night. Not until two outs in the ninth, after Brad Lidge's earned run average exploded in the top of the inning. They looked as if they resented Charlie Manuel talking to them about how bad they've been playing. Not a first-place team right now. Funny, but it all seems to depend on Chase Utley. While he was playing MVP-calibre baseball the team looked great; once he started slipping into the doldrums, they've gone down with him. Liz - you said it! he is completely swagger-depleted. jjp - yeah, the heat depletes my blogging energy. gg - get back on the bandwagon! the bats have awakened!! Hey, at least Adam Eaton is gone - for now. I never heard much about blueberry buckle before and here it is again. I had my first last March visiting my 93 year old uncle - he got up extra early in the morning to make it for me. Then in June my mother made it for me. Now you're making it. I guess blueberry buckle rules.